The SuperSteer P3032 bell crank for Workhorse and Chevy P30, P32 and P37 chassis eliminate play in the steering by featuring a new casting with roller bearings instead of bushings. You may have experienced play in the steering wheel when driving your Chevy or Workhorse chassis motorhome. This play in the steering wheel can often be attributed to the bell crank (or "idler"), which supports the steering linkage. Original equipment designs utilize common sleeve bushings, which often wear out prematurely and cannot be adjusted for side play. By contrast, SuperSteer P3032 bell cranks utilize tapered roller bearings, which are far better at carrying load and can be adjusted to achieve precise movement. 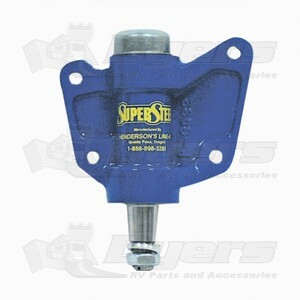 The SuperSteer P3032 bell crank helps provide steering support in your motorhome and is a great form of steering upgrade. The Super Steer Bellcrank has been tested to 30,000 lbs. of stress at the end of the bellcrank, with no side-to-side or vertical movement after the test. This is why the Super Steer Bellcrank offers a Limited Lifetime Warranty. Requires virtually no maintenance, because it´s fully sealed to keep out road dirt and water. Ideally, the Super Steer Bellcrank should be installed in pairs for maximum effect and safety, but a single unit can be installed on the driver´s side only (the passenger side does not wear out as quickly). Rugged high-strength casting, steel spindle and tapered roller bearings. Reduces steering road wander and rut tracking. Helps to eliminate steering play - extends tire life. Bolt-in replacement for the original component. Lifetime warranty to the original owner. Fixed my problem, a little pricey but now I can relax driving and wife feels safe to drive. Installed on 2004 Fleetwood Fiesta Workhorse P32 chassis thinking it would tighten up my steering response. Steering is still sloppy (steering wheel turns a few inches before anything happens), wasted $400-500 dollars and no improvement in steering response. Should have bought a Ford chassis motorhome. Bought this in March 2014, fast shipping, a little pricey, instruction are easy to follow, but my 1990 28 foot Allergro motor home, on a P30 chassie, is so much easier to drive. I had bad case of the "Tail wag the dog" problem. I only replaced the one by the steering sector because the other one is still tight and I had the front end realigned. This vehicle has only 54,000 miles on it and the old crank bushing was already noticably worn (3/16 inch play side to side and 1/4 inch up and down) causing very loose steering. I would recommend this bearing crank over the bushed. It will probabley last as long as the motor home and it's adjustable. It's also a safey issue, especially on windy days and when vehicles pass you. Owning a motorhome is like having a job, there is always something to fix, but this is one problem that I won't have to worry about. Very Fast shipping ! We have not installed the Bell Crank at this time.